Thai dishes are usually vibrant, exploding with flavor and spicy notes. 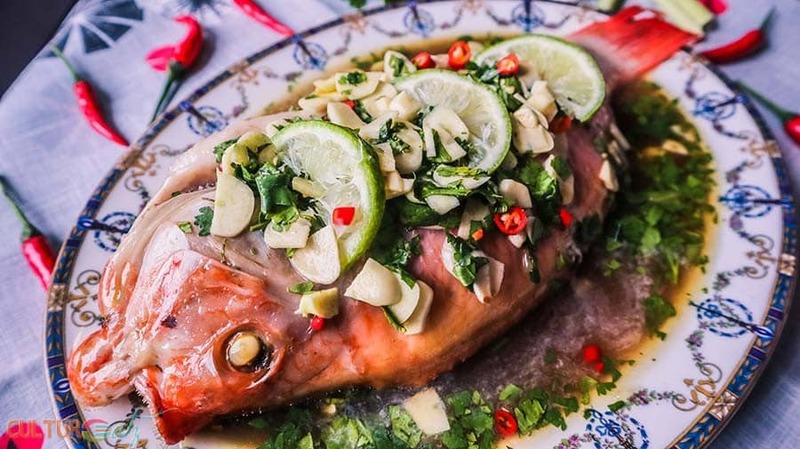 This Thai Steamed Fish Recipe with a Lime and Garlic Sauce is not the exception. And the gorgeous presentation makes it a real conversation starter too. For the third Eat the World Challenge we are taking a trip to Southeast Asia, more specifically Thailand! 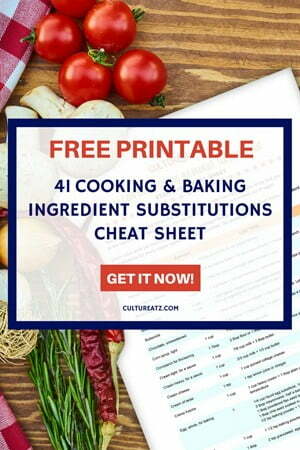 I was shocked to realize I have very little to show for authentic Thai dishes on CulutrEatz. No Thai style fish, or even less a Thai style steam fish for that matter. And I have been wanting to steam a whole fish for a long time but always felt too intimidated. Well, this challenge is about facing all sorts of fears so I prepared one of the most popular Thai dishes, a Thai steamed fish recipe with a Lime and Garlic Sauce. Are you freaked out by a whole fish on a plate? I know many people are but this is the presentation of most countries in the world. The head is a bit freaky but many people claim the most tender meat is on the cheeks. I also grew up learning to fish with my dad and he taught me how to gut a fish at a young age. It’s good to really know where your food comes from and not just think everything comes nicely wrapped and sanitized like we are used to from a grocery store. So here is your chance to get a closer experience to Thai food and culture with this dish, break out of your comfort zone. My fear in this recipe is steaming the whole darn entire fish. I had never done it before on the blog and I was a little scared. Yet Asian steamed fish recipes are very common in restaurants. You know the one with the big fish tank where you can even choose the fish you will eat? I wanted to do that at home! I also learned how to steam a pudding this year, it’s my year of steaming lol. But it turned out to be way easier than I had assumed. 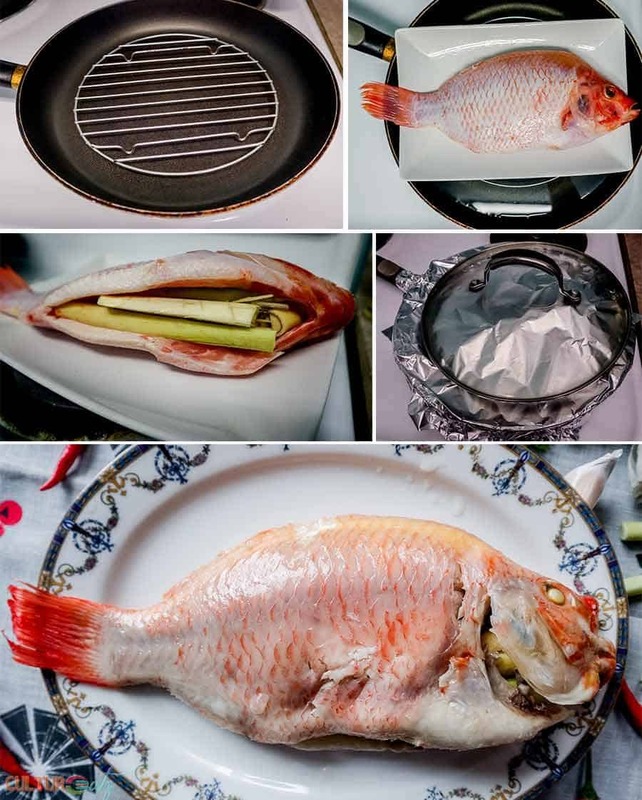 This is a simple steam fish recipe for your first time. First, you have to get your hands on a whole fish that has been gutted, and the scales and gills should be removed. What is the best fish to steam you ask? For this recipe, you would want a steamed barramundi which is an Asian sea bass. Great alternatives are red snapper, rockfish, tilapia, trout, halibut or even salmon. Now that you have your fish, how to steam fish in a steamer? And do you need a steamer? Good news, you can hack a steamer at home. 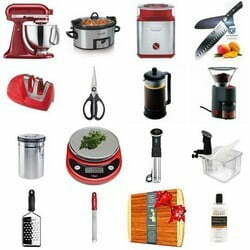 Just get a wok or a large skillet and place inside a steamer rack, a round rack or 3 balls of crumpled aluminum. On top of this place a plate where the fish can lay on. Fill the wok with 1-2 inches of water and make sure the plate is high enough that the fish does not come in contact with the water. Finally, cover with aluminum or a lid that is big enough. Bring the water to a boil and steam for however long the recipe indicates. A rule of thumb for whole fish seems to be 10-12 minutes for 1 pound and add 2 minutes for every extra 1/2 pound. This is a really simple recipe to prepare but the key to success is not over-steaming the fish. The meat should break with a fork and be opaque all the way through, but the bones should be slightly translucent. That is it, you now know how to make steam fish. All you need to add is a steam fish sauce. When I was choosing the next country I knew I wanted to go to Asia, but which country. I soon realized I had very little authentic Thai recipes, just Thai inspired ones like my Thai butternut squash chilled soup. Basically, you can add a touch of Thai curry paste and call it Thai inspired. 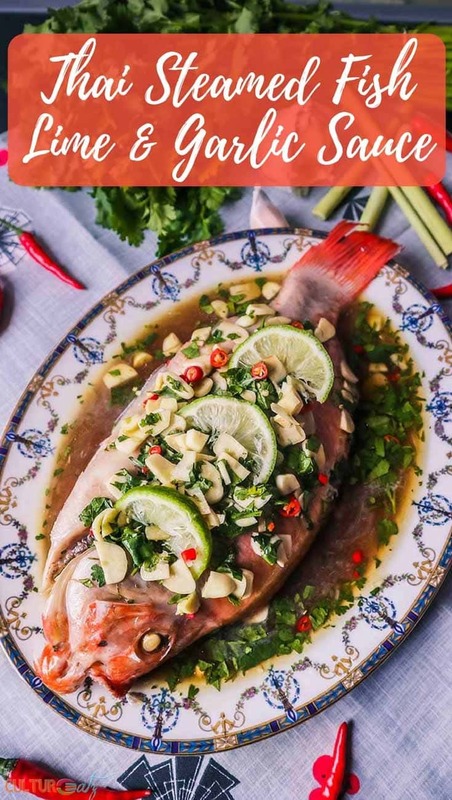 So my goal was to find an authentic Thai dish and I found this Thai steamed fish recipe with a Lime and Garlic Sauce from this Thai recipe site. Since then I have also made a Thai Sweet Potato Curry Cricket recipe. As we discussed earlier, we now have a beautiful whole steamed fish, fragrantly perfumed with lemongrass. Now we need a Thai sauce for fish. Lime sauce for fish is common for steam fish recipe Thai style. In Thai cooking, a garlic sauce recipe is also popular with the addition of lime and cilantro. For this dish, we will make a batch of this garlic and lime sauce with the addition of Thai chili pepper. The sauce itself is made of chicken broth, fish sauce, and lime juice. This recipe definitely covers all the essential Thai requirements: spicy, sour, a little sweet, garlicky, all perfectly balanced. And it is a quick and easy steam fish recipe to make. Really, the hardest decision you will need to make is how many Thai chili peppers can you handle. I added 3 and I was happy but in Thailand, it would be more like 10 to 25 peppers. But how did it taste? Well, let me put it this way. 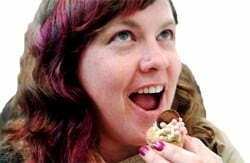 Once the photo shoot was over, I already had a fork in hand. Somehow, no idea how, the next I knew I ate half the fish, right there on the photoshoot set up. So yeah, it’s really good! 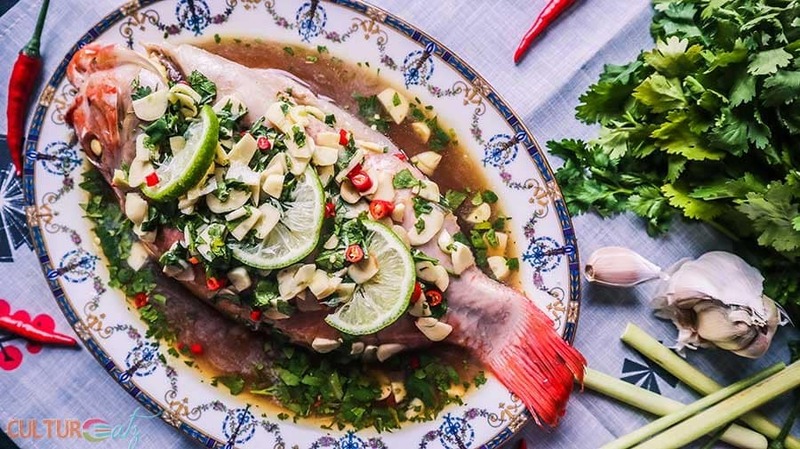 No wonder this Thai steamed fish recipe is one of the most popular dishes in Thailand by the locals. Prepare your steamer (see blog post). Score the body of the fish with 3 diagonal cuts on each side. Cut off the top half of the lemongrass, bruise the bottom stalks well, and place them inside the cavity of the fish. Steam the fish over boiling water over med-high heat for about 10 to 15 minutes, depending on the size of the fish. In a small saucepan, heat the stock to a boil, add the sugar, lower heat and stir until the sugar is dissolved. Remove from heat and pour the stock into a bowl. Add the fish sauce and lime juice. Mince the remaining ingredients and add it to the sauce. Stir well. Place the fish on a serving dish with edges. Gently pour the sauce over the fish, keeping most of the garlic, coriander, and chilies on top of the fish. Serve with Jasmin rice. I've never been one for eating fish that still look like fish, BUT, I would so give this a try! lol! Oh it is so worth it, I ate half in a go it was so good! Oh will def. make the steamed fish recipe one of these days. We don't eat enough fish so I must make an effort and nice recipes will help. Will pin it for later! Same here I need to eat more fish. 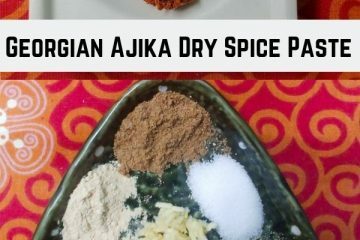 This recipe is a must, you'll make it every night lol! I love whole steamed fish but my fave is Hongkong style. But I will try this, too. Something different! Oh what is Hong Kong style exactly Carol? I'm way too squeamish to cook or eat a fish in its entirety but man, what gorgeous presentation. I would totally eat it off the bone. The sauce and accompaniments look incredible. If you took off the head, it is exactly what you would normally eat (maybe have some cut it off before serving :-) ) It is worth facing fears, awesome flavors! MY HAND IS RAISED -- as in, I WANT SOME - STAT!! You know me and my fishhhh obsession!! So I am going to NEED on this! He he, come on over but this will turn into a fish food fight, it is is good! I had the same thing last nice, Yum! Really lol? what a coincidence. I'm not usually big on cooking a whole fish, but this one is so beautiful, I think for sure i'll give it a try. The flavor combinations sound delicious together. Thank you so much and you would love this recipe. I guess picking a prettier fish in the first place helps ha ha! I love Thai anything and make it often. However I've never made a whole fish. Now that is impressive! No you would not want to share Liz, again, I ate half the fish right after the photo shoot, on set lol, oops. I've been getting braver about trying new Asian foods. I'm usually worried about the spiciness level. But I do love fish, and the idea of a steamed fish is very appealing. 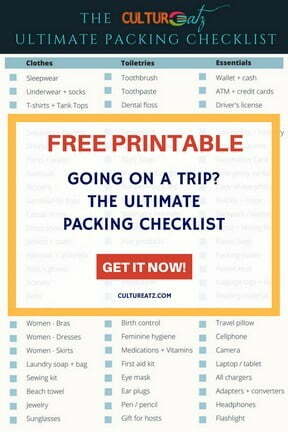 Your photos and instructions are perfect! Thanks for a delightful post! Thank you Tami and this is a perfect one to try and you can totally omit the chili peppers if you like, or start with a little. They are only added to the sauce too. I was drawn in by the flavors of this dish, and then when I saw the presentation with the whole fish on the plate, it looked even more appetizing. I haven't prepared a meal like this myself, but I'd love to. So glad you are not one to be afraid of a whole fish lol. The dish is amazing. Hope you try it with my complete explanations on how to steam a whole fish! It's really easy. You had me wanting to dig my fork in there right along with you! I love your trick for making your own steamer out of a rack and a wok - brilliant. I can imagine how tender and moist that fish must have been. I've got to try it. I did a salt-crusted fish once and it was out-of-this world moist. I'm guessing your steam fish method would be along the same lines - and much less messy! Your sauce sounds full of fantastic flavour. Thanks for such a simple but elegant recipe. Who said I used a fork lol? Yes I did ;-) And yes for a first try it is easy to make your own setup. The sauce is out of this world. Oh I have always wanted to try the salt-crusted fish recipe. Will have to get to it. Until you do it, cooking a whole fish is intimidating! It does taste so good, though -- better than fish fillets. And the presentation at table is so dramatic! Although I usually hash it up when it comes to serving -- my pieces aren't the neatest. Anyway, good dish -- and love the sauce. Thanks! That is right, intimidating until you do it and realize you have wasted so much time. Yeah plating it after steaming is a bit tricky lol. But it's so easy! I hope you try the sauce. I think serving a whole fish in this way always looks so impressive, really like the sound of those flavours. It really is impressive and easy to make. I need more fish I have a bit of sauce left lol. Thai food is definitely my top favourite cuisine. Your steamed fish looks light, yet packed full of flavour because of that wonderful sauce! Thank you and yes Thai food is so good. The sauce was great and all that lemongrass in the fish! What a beautiful presentation! I have a couple of whole fish on my blog, and I know some were squeamish, but the fish, cooked whole is delicious! Thank you so much Loreto. I never found the meat on the cheeks of this fish. It was so perfectly steamed the bones just pulled off like butter lol. Everything was amazing, we mostly used the essence of Thai flavors in both our recipes I saw. Pot luck anyone lol? We love, love, love seeing the whole fish! Thanks for the great recipe and event, too. I love it! 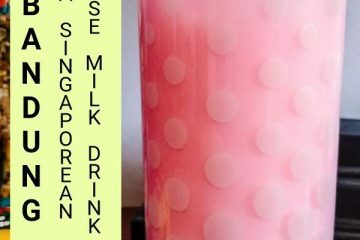 Thanks for choosing this theme Evelyne and for sharing this recipe. It looks like a keeper. Thank you Wendy, so glad you are a part of it and yes it was an awesome fish!